Bedroom feng shui is very important to ensure not just a good night's sleep but also that your finances remain protected. Windows and beds don't mix. In feng shui, a bed facing a window violates the first feng shui bed placement rule that advises against placing your bed in front of a window or underneath a window. This type of bed placement can also have negative effects on your personal health. The chi energy needs to flow freely throughout your home. Doors and windows are the openings where chi energy enters and exits your home. The pathway through a room created by windows can be visualized as wind current moving through the window into and out of the room. With this visualization, you can easily see how a bed placed directly in this pathway would receive the brunt force of this energy. You can also begin to understand how this flux of energy moving over the bed would result in very little rest. The constant flow of energy over the bed creates too much yang energy. If you have no choice and must place your bed underneath a window or in front of it, there are several things you can do to reduce the effects of the chi energy moving in and out of the window. Cover window with thick heavy draperies that completely cover the window and block any light. You can open the draperies during the day to let in positive chi energy, but when you sleep, make sure the draperies are pulled tightly closed. This will in effect block the chi energy from rushing over your bed while you sleep. Some feng shui practitioners recommend installing blinds and then position the slats in an upward position to redirect the chi energy. This may offer a partial solution. You can use a headboard to offer an effect of having a wall between you and the window. There are two things you must consider when taking this approach. Substantial headboard: Make sure your headboard is sturdy, strong and high. A heavy headboard that is very high can offer you the protection of a wall. Allow space between wall and window: You need to make sure that you leave enough space between the wall and headboard so the chi energy can still flow within your room. The rule of thumb is to leave enough space so you can walk behind the bed. Even though these actions can reduce the effects of placing your bed under a window, the problem won't be eradicated. A constant exposure to this type of positioning of a bed can, in the long run, affect your health. While the above remedies can weaken the negative effect, they aren't a cure. The only way to avoid the weakening effect of a bed underneath a window is to place your bed against a solid wall. This type of placement gives you the kind of uninterrupted support you need in order to have a restful sleep. Just as you should never sit at a desk with your back to a window, you don't want to sleep with your bed against or underneath a window. The best placement is to always have the support of a solid way. A bed by a window or a bed next to a window may be inauspicious. If the bed is in the pathway of chi energy moving in and out of the window, you need to find a remedy to avoid sleepless nights. A bed by a window is in the path of the chi energy. The chi energy will have a negative sleep effect. 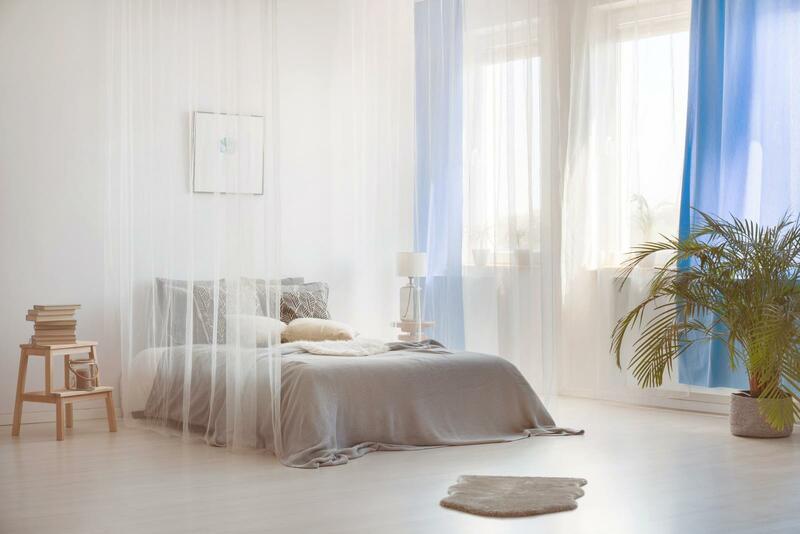 You can hang heavy draperies over the window and keep them closed while sleeping to reduce the flow of chi energy. You may also place a folding screen opened flat to serve as a barrier between the window and bed. A canopy bed style with bed curtains or poster bed with a curtain frame is another great way to block the rushing in and out of chi energy. You can tie back the bed curtains when not using the bed. If your bed is next to a window, so that it shares the same wall as the window, then the chi energy entering and leaving your bedroom won't be flowing directly over you while asleep. This placement won't disrupt your sleep. A bed placed between two windows with a solid wall also behind it isn't in the path of chi energy. The symmetry of this placement is auspicious and allows the chi energy to flow freely in and out of the windows without disturbing those asleep in the bed. There are some practical reasons why you want to avoid window bed placements. If you sleep with your window open and only a window screen separating you and the outside world, you are in a vulnerable position to elements, intruders and even large animals. Another risk is developing an illness from exposure to damp night air or cold winter air from leaky window frames. Before you place your bed underneath or in front of a window, try to find a better placement to ensure you have a restful sleep each night.